23rd COP ended at 18th of November. The Paris agreement, which has been ratified in 2016 and entered into force on 4 November 2016, is expected to be a new version of Kyoto protocol. The conference in Bonn was to decide on the process of the Paris agreement. Usually, the venue of the conference changes annually by continent. However, Fiji as a chair country, couldn’t afford for the huge global event. Therefore, instead of Fiji island, Bonn, Germany, which UNFCCC office located, held the conference. It shows seriousness and irrationality of climate change clearly that Fiji island, the victim of the climate change, couldn’t hold climate change conference. The atmosphere inside and outside of Conference actually depends on the venue. Although agenda was decided, the movement, such as official debate, unofficial lobby, NGO rally or performance in the city which opens the conference is very different. If Fiji island represents the victim of Climate Change, we can assume Germany(Bonn) as a perpetrator. The most welcomed speaker at the conference was 12-year-old boy Timothy Naulusala, whose village was destroyed by a devastating cyclone last year. While Angela Merkel didn’t take advantage of home ground, only giving a lame excuse to Fiji boy’s shout “Climate Change is a fact, not a fantasy”. Germany is being so passive to change their fossil-fuel-dependent energy system that couldn’t even list in “Coal-phase-out country”. In this conference, it is worthy to notice the trend of Powering Past Coal Alliance, closing all coal-fired power plants by 2030. It is the essential point that coal-fired power plants must be phased out before 2050 (2030 for developed countries) to keep global temperature increase well below 2 C.
U.K. and Canada leaded this alliance, and other countries like France, Italy, Denmark, Finland, Austria, Swiss, Netherland, Belgium, Portugal, Newzealand, Mexico, with six local government, Alberta, British Columbia, Ontario, Quebec, Vancouver, Washington joined it. They declared phasing coal-fired power plant by 2030. Despite the main target of Climate Action is fossil fuel, it’s an innovative outcome that the inter-government alliance has been constructed. Of course, there’s a critical issue, those countries’ fossil fuel usage is only three percents of the world. Without the participation of China, U.S.A., India, and Germany, it is hard to exercise its influence. The second trend in this conference is an Anti-Trump Phenomena. Local government and companies in the U.S.A. have promised greenhouse gas abatement. At US Climate Action Centre, which was located by the venue, over the twenties of State governments, fifties city governments, and companies declared the first stage of America’s pledge. If we add these members’ economy, it’s huge after the U.S.A. and China. Then what did Korea do? Let’s focus on coal phase-out. First, Korea was not included in the Alliance. Moon government is saying Energy Transition, but there’s no aggressive strategy in Coal area. It is very similar to Germany, which has a passive position on coal. It is hard to be listed on this trend without any roadmap on Coal phase out, but we are expecting that will happen next year. Secondly, energy transition with coal phase-out in Chungcheongnam-do province was not introduced. Unlike central government, Chungcheongnam-do province has declared their path of phasing out coal. They made a vision with an energy scenario on Energy Transition 2050 through citizens’ participation -- energy scenario workshop. They also held “2017 International Conference on Coal phase-out and Energy Transition” last October. 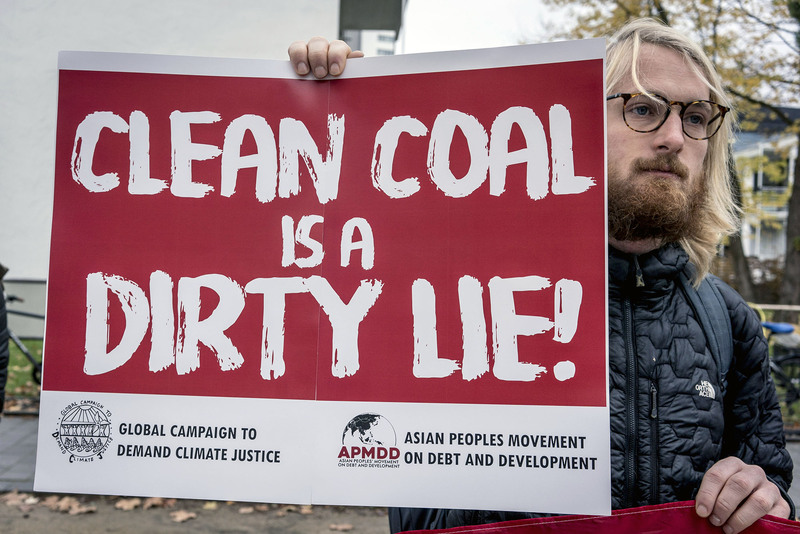 Through this Climate Conference, Korea government should consider why Coal is so critical to climate action. According to CCPI, Korea ranked 58, with ‘very insufficient’ critique. Whether Korea can achieve NDC in 2030 also remains a big question mark. 23rd Climate Conference ended with the adoption of Fiji Momentum for Implementation. Talanoa dialogue will be on the process before 24th Climate Conference on Dec. of 2018 in Poland. We need to decide which path we shall go.